4) A little robot that lives on your tennis racket and teaches you how to get better at tennis. 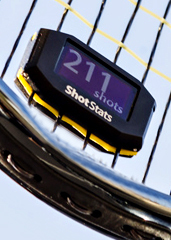 Get all Djokovic for Shot Stats Challenger, a new piece of tennis science from a local team of tennis scientists who want you to... attach a mini computer to your strings that monitors your entire game, available for preorder now. If you’ve ever used a swing analyzer on your golf club, you know the basic idea here. You’ll attach it to your racket, warm up with a Serbian pro and then consult the screen (or the corresponding app) for feedback. Just an absurdly specific amount of feedback. Go play some mixed doubles and forget it’s there until it’s game, set, match. Then, pull up your stats. The speed of your racket head at ball contact. How many balls you struck per minute. The amount of topspin or slice you applied. All there. You can also analyze and share videos with the app. So maybe recruit a bystander to shoot a clip of you really going for it. Hopefully they can hang around for like 18 do-overs.